UPDATE: Congratulations to Mary Has Sound! She won this giveaway. My beloved just cleaned out some old drawers, and was about to throw away this "Nostalgia package" that someone had given him as a gift, years and years ago. We're both trying to glean our possessions a bit, and I don't know exactly what I'd do with it, either... except that it's full of cool and vintage things! So, another blog giveaway is born. Not part of the package, but I'm throwing it in anyway, is a Peppermint Smencil, a "gourmet scented pencil" made from 100% recycled newspapers. 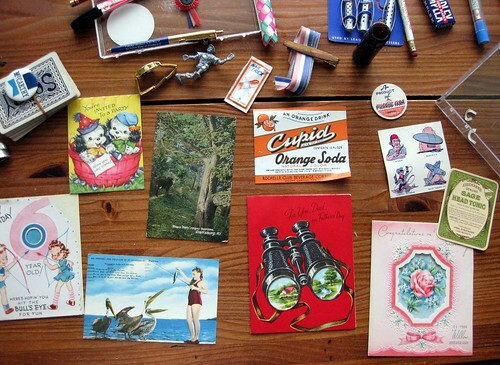 The nostalgia package (Contents: Great Old Stuff!) 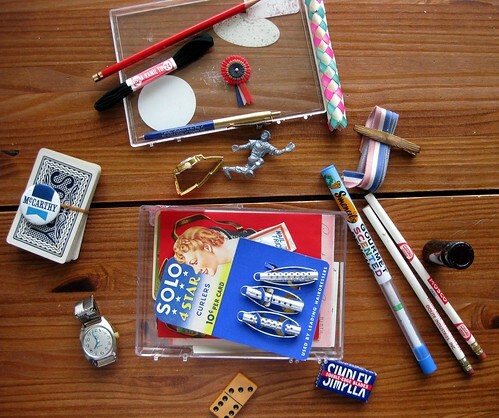 contains a domino, an empty brown glass bottle, two watches, some ribbons, a silver plastic catcher figurine, a pack of cards with a McCarthy button, old hair curlers, more pens and pencils, old labels and paper ephemera, and more! I thought the old paper ephemera might be of most interest to my readers, so I arrayed that all out in the above photo. The greeting cards are unused, but the postcards have both been sent. 3. WHERE: I'm going to be a little loose with the location restriction, in an unorthodox way. Anyone from the USA may enter. If you are in a foreign country, you may enter IF we already correspond (Sirpa, Bianca, Zoë, etc...). If you live outside the USA and we have not corresponded, you are not eligible to win this one. What an awesome giveaway! I'd love to join! count me in on this one too . awesome . I feel special having a link to my blog right in the post! And this is such a cool giveaway and great way to make your "trash" somebody else's treasure it's all so neat, just waiting to be repurposed. I want to join, what an awesome giveaway! What a great idea! I'd love to win. Greetings Missive Maven - toss my name into the draw! Thanks! I love all the little vintage trinkets. What a fun little gift! Thanks for the chance! ooh, I LOVE old greeting cards! I'm so in! Wow, that really is some amazing stuff and I would love to enter! craftgasm @ gmail dot commmmm. 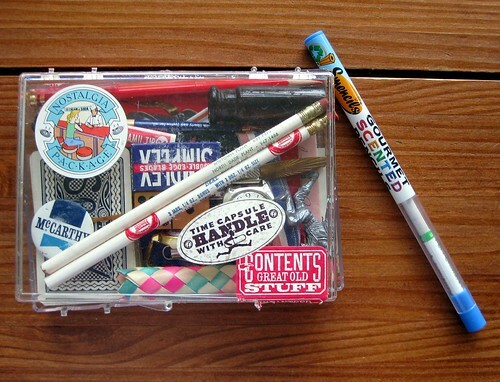 I love blog candy, already signed up for the first one, couldn't pass on this one either!